The Evolution Series Stonefly Nymph is the next cog in the ever-changing wheel of the fly tying future. 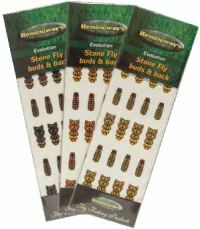 The Evolution Series boasts some of Hemingway's most realistic, exciting, tier-friendly designs to ever be introduced into the world of fly tying. Hemingways product designers took a natural Stonefly Nymph and said what makes this insect so amazing and how do we build a fly that will imitate it as closely as possible. this is how how they came up with this simply perfect design. The awesome features that make this series so real is the one piece integrated head, legs, and antenna thorax. A low profile channel on all abdomen and thorax parts so every fly will have an extremely low flat profile, natural proportions, and realistic movement along with a newly designed abdomen and tails. The redesigned wing buds and abdomen backs along with several new exclusive natural colours simply make the Evolution Series. The only thing they didnt add were flames it just didnt need em. 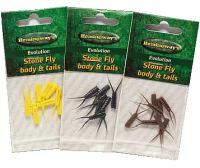 Tie a new Hemingways Evolution Series Stonefly to the end of your leader and let the fish be the judge!